Rockland County, NY - Hoping to stem the measles outbreak that began when travelers who were infected with the diseases visited New Square over the Succos holiday, Rockland County Executive Ed Day took the unusual step of declaring a countywide state of emergency that would ban all non-immunized minor children from public places for the next 30 days or until they receive the first dose of the two part measles vaccine. Day made the announcement at a press conference held this afternoon in his offices, describing the growing measles outbreak as a public health crisis with potentially life threatening consequences. 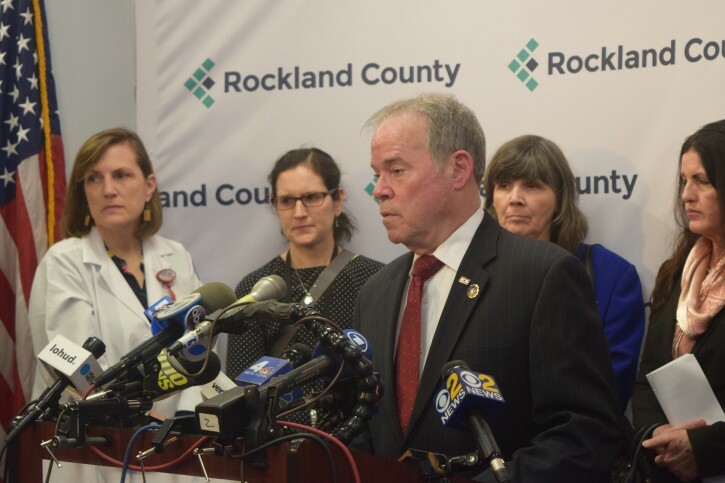 153 confirmed cases of the measles have been reported in Rockland County over the past 26 weeks, making the outbreak the largest in the United States since the measles were nearly eradicated in 2000. The state of emergency takes effect at midnight, March 27th. It includes schools, stores, public transportation and houses of worship that are legally authorized to hold gatherings of 10 or more people. Only infants under the age of six months and those with a confirmed medical reason would be exempt from the immunization requirements. Newly vaccinated children would be permitted to appear in public four days after being immunized. While parents who defy the state of emergency could face penalties of six months in jail or a $500 fine, Day noted that the action was intended to encourage vaccinations in order to prevent the spread of the disease and was not intended to be punitive. Day acknowledged that no enforcement plans have been implemented. Day described his announcement as “an attention grabber” in a one on one interview with VIN News. With the measles outbreak starting last Succos, putting plans in place to have even more county residents vaccinated before Pesach was no accident, said Day. While Day would love to see 100 percent compliance with the state of emergency, he understands that there will likely be those who will defy the order. He hopes that enough county residents will see the state of emergency as a wakeup call and vaccinate their children, thereby increasing the herd immunity that offers protection to those who cannot be immunized for medical reasons. Word of the embargoed press conference leaked out three hours ahead of schedule, leaving three staffers at Day’s office answering an endless stream of phone calls. Some were from public facilities looking for signs being printed by the county advising parents that unvaccinated children were not permitted; others were from nervous individuals wanting to know more about the state of emergency. Numerous callers who said that they have not vaccinated their children for religious reasons were informed that there are no religious exemptions to the state of emergency. Day said that he does not expect the ban to increase the already tense relationships that exist between Jewish Rockland residents and their non-Jewish counterparts. He noted that the state of emergency applies to all county residents equally and not to a specific religious group, although he acknowledged that uninformed individuals have been making hateful comments about Orthodox Jews and measles for weeks. “Some people are idiots,” observed Day. Gary Sipeser, CEO of the Jewish Federation and Foundation of Rockland County expressed his fear that the state of emergency declaration will only increase prejudice against the Jewish community. Community activist Rivkie Feiner said that she had spoken previously with someone whose teenage daughter was approached by someone at a mall and asked if she was Jewish. Answering in the affirmative, the girl was told that if she was Jewish then she must have the measles. Don't start screaming "antisemitism". Just do the correct thing and go vaccinate! My wife really likes to Shop in Monsey, especially for children’s clothing and shoes, we used to take the whole family to The Evergreen center, my wife is expecting, and she is not comfortable bringing our children to those stores. Hope they get this epidemic under control. for those who are upset you have a SOLUTION - get VACCINATED - you and your family. All other boroughs in New York State should do the same thing. The majority of EU countries do not mandate vaccines. Perhaps Rockland should ban ALL Europeans from visiting and not only target European Jews. Any other private info you want to share. Some people seem to want to live in the Dark Ages. “ for those who are upset you have a SOLUTION - get VACCINATED - you and your family. People aren't just "upset". Listen to Plotkin's deposition and then you will understand why. Think, why would any parent go through this with all the pressure now? Why would any parent risk disease?? Watch Robert Kennedy's presentation last week at a press conference. We're not the only ones creating this epidemic. I wonder how much money the measles epidemic has cost the County. I guess they wont report it until the epidemic is over. We may not be the only ones creating the epidemic, but the spectacle of Jewish parents participating in any way, and putting their own children at risk, is a disgrace. Why wasn't my comment posted? Because I stated facts that we don't want to hear? Isn't this a platform where we can share ideas and knowledge that we have? Can you dispute anything I stated?